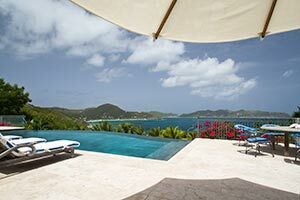 Built in Palladian-style adapted to the tropics, Villa UJV 285, also referred to as Bon Temps, is a six- bedroom villa located on the west side of Pointe Milou, St Barts, with broad sunset views of Chevreaux, Fourchue, Toc Vers, St Martin and Anguilla. Elegant open-air living overlooking the large 50ft infinity edge pool disappearing into the ocean beyond. Two curved stone banquettes, appearing to float over the ocean, are the perfect place to watch the sunset. Surrounded by lush tropical gardens, the villa is decorated in white, soft greens and blues with hand-painted tile lounge banquettes on the terrace, custom mosaic floors in the living area and limestone floors throughout the bedrooms and terraces. All six bedrooms have equal amenities including high ceilings, stone-tiled bathrooms, and ocean views. Four bedrooms are on the same level as the living area. Two have private terraces and outdoor showers. Two more bedrooms are on a lower level and have private covered porches. The open-air kitchen is equipped with a marble-topped bar, Laconche stove and unique Italian and French glassware, dishes, linens and tableware for entertaining. Modern conveniences include a fitness/exercise room and all the necessary technological amenities. A gated entry assures privacy. -Children welcome upon special written request.